People across Greater Manchester were awarded with tickets for their hard work in communities thanks to Manchester Arena. Manchester Arena donated 100 tickets for us to give to the stand out stars we’ve met in the communities across Greater Manchester to attend The X Factor Live Tour with friends and family on Friday 20th February. In 2015, Manchester Arena are celebrating their 20th Birthday, and they have chosen Forever Manchester as one of their Charities of the Year. The Arena have offered us many perks as their Charity of the Year for 2015, including the opportunity to collect at the Noel Gallagher’s High Flying Birds, Take That and Simply Red gigs this year, which will hopefully bring in a great income. Our branding is also visible throughout the Arena, using their hashtag #WeAreManchester, which fits perfectly with our ethos and what we’re about. 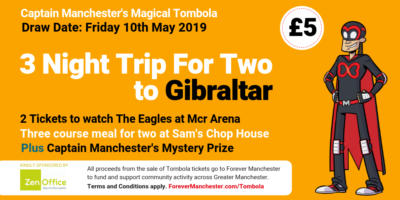 It’s a great privilege to be chosen by Manchester Arena in their 20th anniversary year and we hope to raise some great funds with this opportunity. As part of this commitment, the Arena offered 100 tickets for The X Factor Live Tour for us to award to community groups across Greater Manchester. We were pleased to award tickets to pupils who took part in our Cool 2 B Kind programme delivered in primary schools in Oldham by our Community Builders. The tickets were awarded in assemblies to the pupils with the most improved behaviour since the Cool 2 B Kind programme ended. Teachers at Alt Primary School and Stoneleigh Academy in Oldham surprised pupils with the tickets for themselves and an adult to take them to Manchester Arena on Friday 20th February. As well as these schools, tickets were awarded to a number of community groups across Greater Manchester to celebrate their involvement in their communities and reward them. The groups were all given their own section in the Arena taking up a whole chunk of it and had a ball. We’re looking forward to the year ahead and hope our relationship with Manchester Arena will be the start of great things.